A Giveaway at Pen Chalet! (and also a discount code) | Inkdependence! 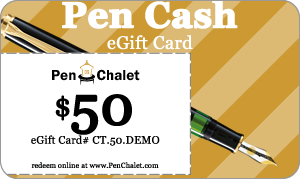 Ron at the Pen Chalet contacted me to help spread the word about their current giveaway. Head over to this page to enter, and get your chance to win one of two gift cards ($50 and $25). You have until the 14th of April for this one, but don't dawdle. Also, Ron has been gracious enough to offer 10% off to my readers who enter the coupon code INKDEPENDENCE at checkout. Go check them out.